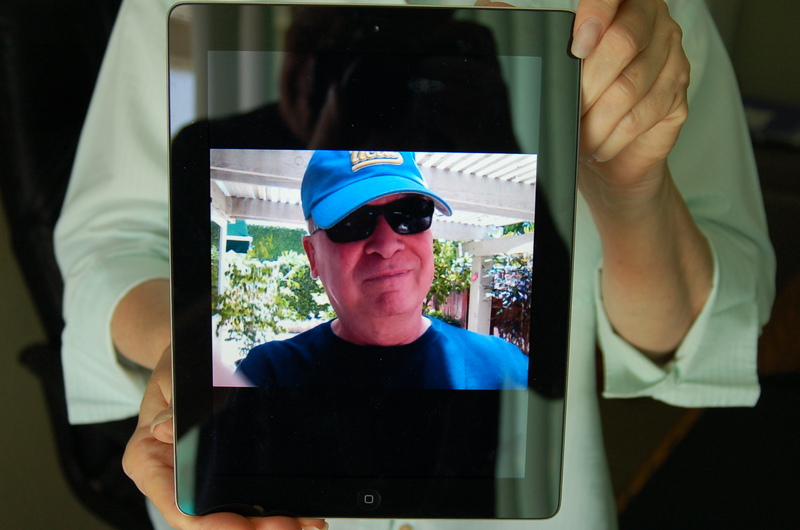 DON’T GET ME WRONG: we love Kris’ new iPad2. On the cool scale, it rates a solid nine. Once you work your way up the learning curve — and it’s a steep one — the performance is big-time slick. Even with the important ability of composing copy mostly missing, it can still rival many of the functions of a laptop. In fact, I’ve pretty much postponed any thoughts of replacing my aging Dell — the one with the busted camera — given the easy mobility of the iPad2. Then too, I can continue to write with serious intent on our desktop. The iPad2 can work email, display PowerPoint presentations — which is a real wow in the conference room — take pictures and display them on a nine-inch screen; you can simulate Skype (it can do Skype as well) with another owner of an iPad2; and it can put you on the Internet with ease, download and display books — just like a Kindle — plus rock and roll with thousands of apps. Super stuff. So what you end up with is what amounts to a prestige item. Same functions, but in much more snazzy duds. Is it worth it? Well, depends on your needs. A friend in sales and marketing says it’s a fabulous tool for pitching her product line, especially now, while the technology is still fresh. 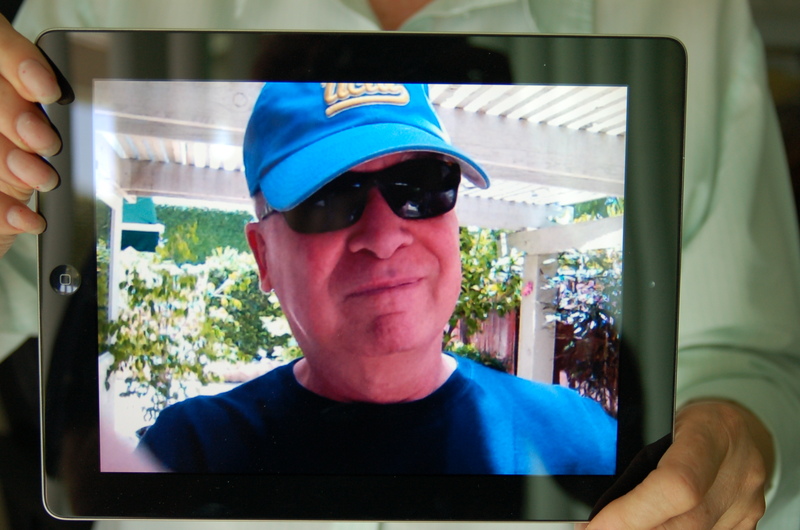 And again, that big and mobile display is impressive; we bought ours largely because we found the potential to communicate from various points on the planet to be so attractive — that is, being able to see each other on the big screen. But that old technological bottom line still reads overkill. We now have five machines that essentially do the same thing. It’s all part of a stunning step, to be sure, from the ’50s where a computer that could do worlds less and filled a single room, but, but, but, but… And, when we finally sat down to see what the $700 we’d just dropped could do, Kris and I looked at each other and said, “Oh [f-bomb], here’s something else we have to learn how to use.” This was after a preliminary getting-to-know-you session at the Apple store, where the average age of the help looked to be 18. So ultimately, the issue at the time — and still — was “Do we really need this? Just how important are cosmetics? I guess what it comes down to is that we’ll get used to it and decide it’s essential to our lives (and isn’t that just a bit sick? ), in the same manner that you’ll now return to the house if you’ve driven off without your cell phone. This all reminds of my days back in the audio business when we pushed a technology called “Dolby noise reduction,” a process that supposedly reduced a problem called noise in the playback of cassette recorders. We sold it and people bought it because they believed the pitch. Except that the “noise” wasn’t actually removed — listeners just decided that it was because we clipped most of the high frequencies in the music where the “noise” seemed to reside. The point being that people will always buy what is new, assuming an enhanced quality of life because of clever marketing. And aren’t we smart: We did. 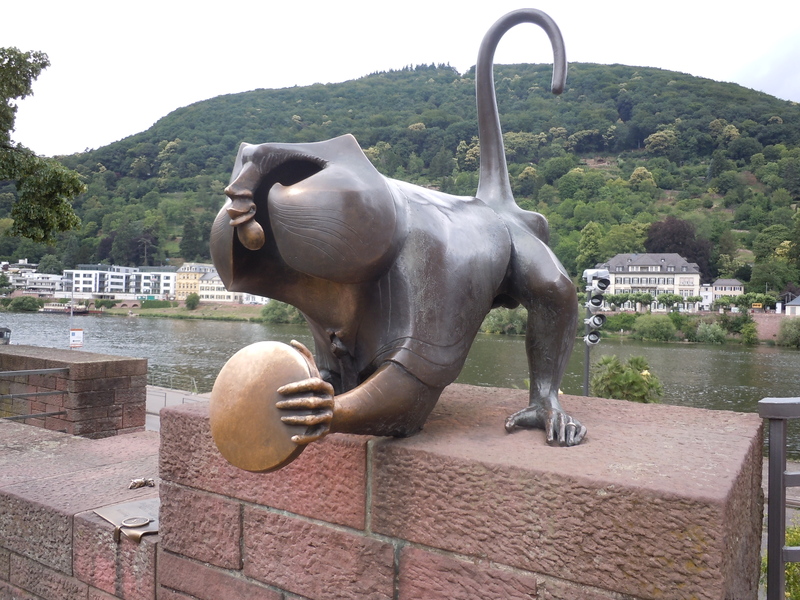 I wouldn’t have thought of this, but Kris did: a quick stop at Heidelberg, land of beer steins and lots of dark beer to fill them and leather pants. The opportunity came during a business trip that she and a half-dozen colleagues had to Germany last week, and naturally, since I wasn’t along, it involved yet another European train. The city of 145,000 is still one of the highlights of the country, and you can check out the highlights on Wikipedia. It’s long history is by turns both charming and messy, but Kris discovered that the emphasis now is on the charming. 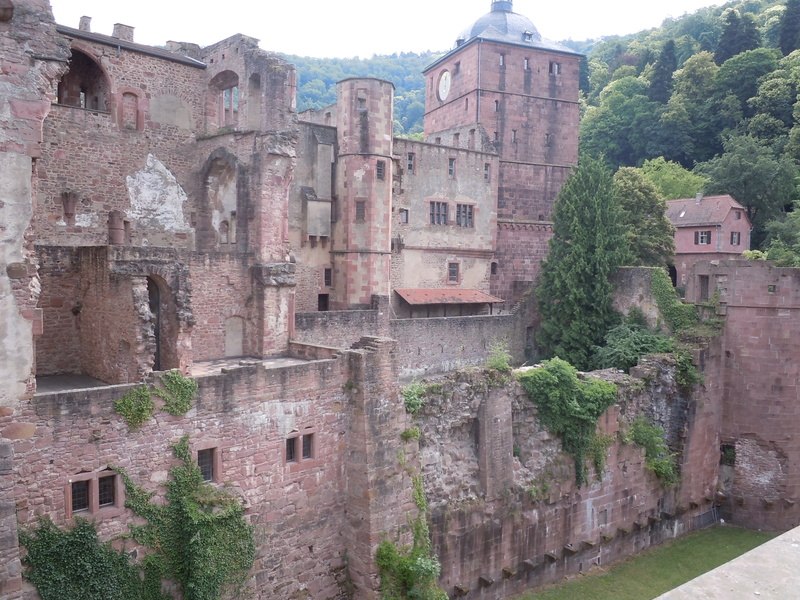 The famous castle is still there, somewhat worse for wear, and weiner schnitzel — Kris was not impressed — is available on nearly every street corner. 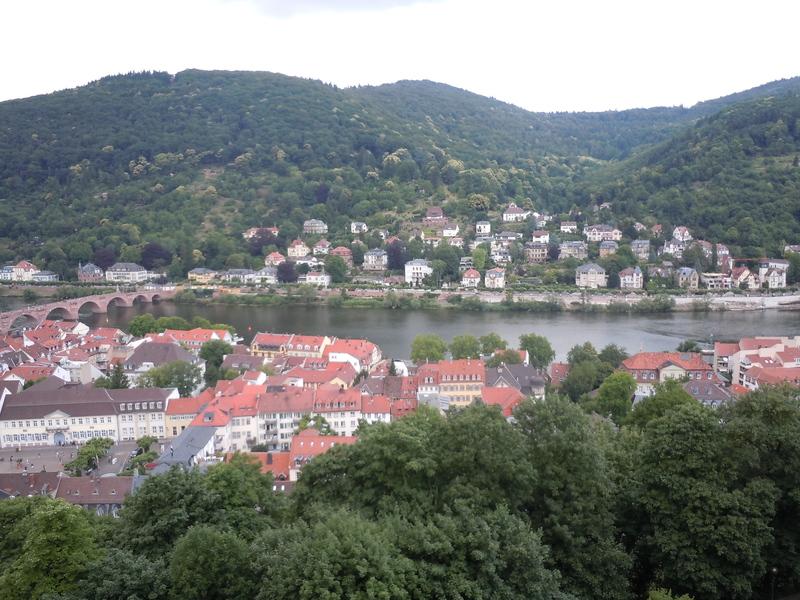 What she really found amazing was Heidelberg’s interest in matters green, even beyond the verdant hills. To be sure, Germany is well-known for its Autobahn, which runs through Heidelberg, but the local train station offers a stark contrast to the traditional kiss-and-ride seen at our local Amtrak stop. Bikes. 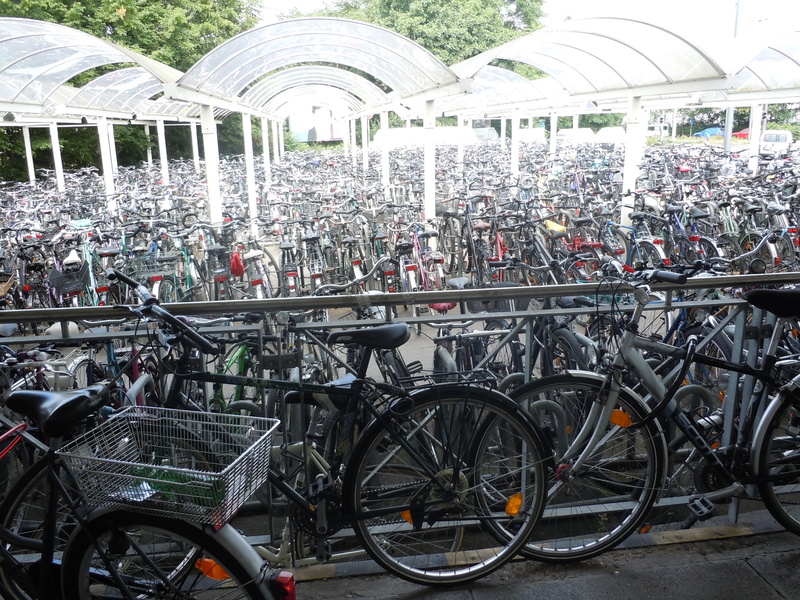 People ride and secure them by the thousands at endless racks that surround the station where her train arrived. So what you get is pedal-ride-walk-ride, with not a single gallon of gas consumed, since the trains themselves are electric powered. “There were bazillions of bikes all over town,” Kris said, “along with racks to hold them. There are buses as well to take you wherever you wanted to go, but those bikes were everywhere.” But not a lot of riders. She said that the city was surprisingly quiet, perhaps, she assumed, because of a holiday. And price? The train was about three bucks, which included free access to the buses. One of the surprises of roaming through subway (Metro) corridors is running into street musicians at work. 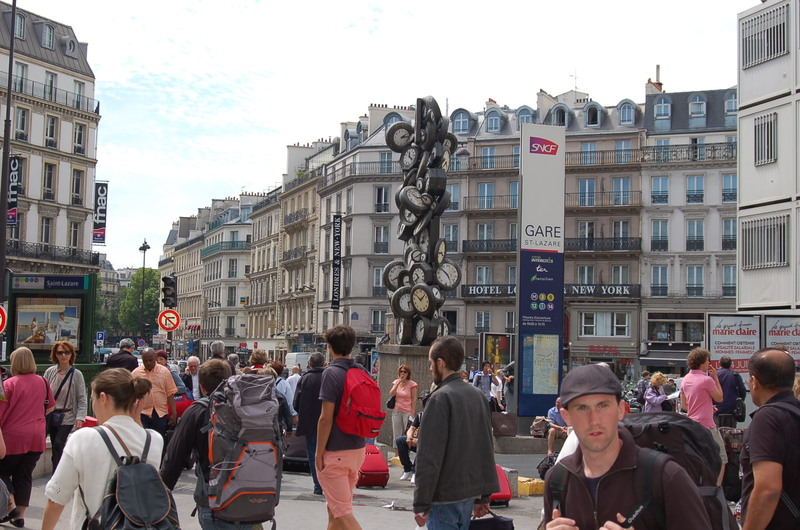 This happened several times during our transit around Paris, and in every case, it was worth it to stop and listen. They were that good, and they certainly were not camera-shy (see below). I’ve always had a fondness for people who make music in public places and who have empty instrument cases for contributions. Back in New York there’s a guy who plays a pan pipe — actually, a series of them — at the corner of 5th Avenue and W. 44th Street, and if he’s there when I am, I lean against a nearby building and watch him do his thing. There’s also a prominent blues singer who works subway stations in the city who people will go out of their way to see. And one time only, none other than Joshua Bell did an impromptu concert in a Washington, D.C. metro station, just to see if people would stop to watch a world-class violinist play free-of-charge. Some did. 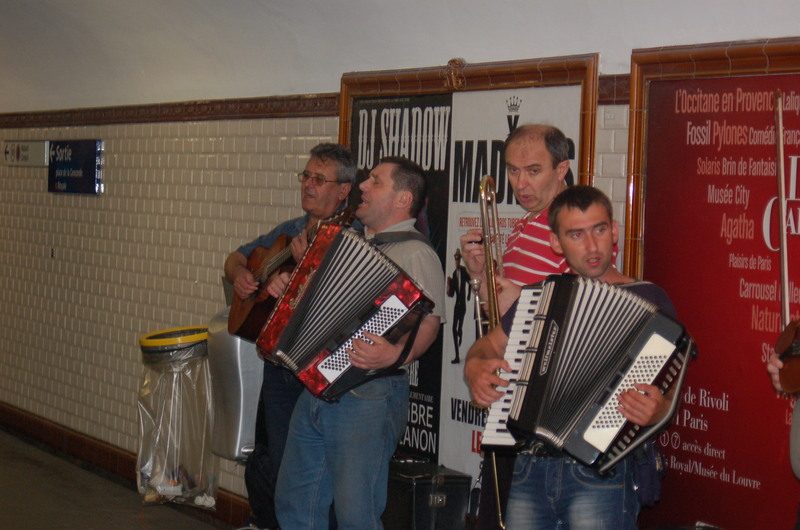 So there is music in the streets, and Paris is no exception, with an emphasis on the transit system below them. In the corridors between stations we saw two of them. First, there was an honest-to-God beer hall band that had to be an import from Germany: Guys who sang and played instruments that included a violin, an accordion and a trombone, and a woman who handled the basket for contributions (Of course I added a couple of eros!!) And right here I should have a link so you could click and listen, but no such luck. Had I been on my game and used the recording app on my smarter-than-me phone, it would have been a different story. Nevertheless, it was a special experience, with the kind of the songs you sing along with — if you happen to be fluent in German. 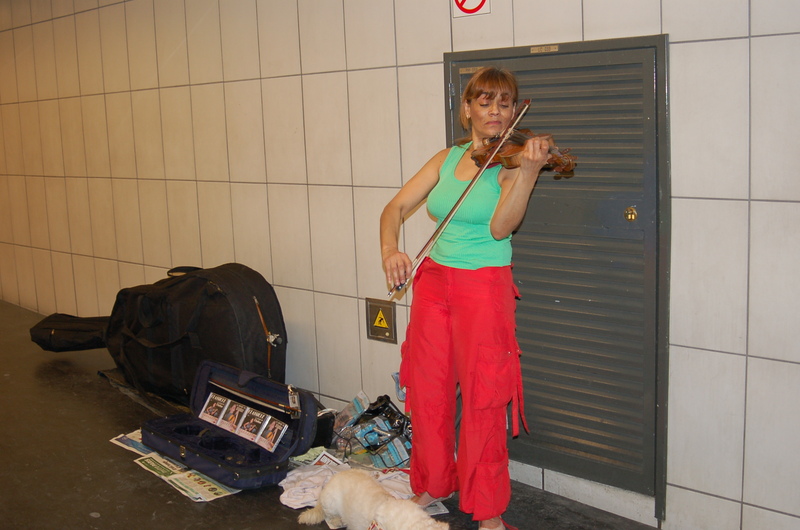 In a different style — and a different station — there was woman and her dog who played the violin — the woman played and the dog listened. So did we, to a Vivaldi string quartet in which she handled the 1st violin part in accompaniment to a CD. We stayed until she finished, gushed over her brilliance, and petted the dog. How do you find these people? Just listen and then bolt through any number of corridors until you find them. I have no idea if there’s any permissions involved. I assume they just set up in the corridor of choice and play, although given that I’ve never heard acid rock or rappers in that kind of venue, there may some semblance of supervision that’s part of the action, perhaps related to those in authority — who have, by the way, managed to completely eliminate any and all graffiti from the system. I haven’t got a clue how they do that! A little Parisian jazz is on tap for our next visit. But then you gotta pay dearly for that! OUR CONSENSUS ON PARIS, based on a recent visit, is that what you really notice is the attitude of the people. They love who they are, where they are and what they’ve got. For all the notoriety, the food is not that remarkable, unless you happen to be big on croissants and cheese, and you’d have to be nuts to get behind the wheel of almost anything within the city limits. On the other hand, there is a happiness, a joie de vie, that is not only evident, it is everywhere. Once, when buying tickets for passage on a Metro train, the agent refused to do business with us until we greeted her with a robust Bon jour. So we plugged in right away, and loved it. But then, we’re not your typical tourists. The only site we targeted was Monet’s gardens, and casual planning killed that one — too far from the city and insufficient time. Instead, we prefer a hanging-out approach, with the adventure being where we find ourselves at any given time, so people watching as we stroll is what we’re after. It works because we don’t find the language barrier to really be one, in that you can get a sense of what a sign or notice means with careful study, plus English is never that far away; the help in most restaurants can manage the basic necessities, and surprisingly often people on the streets will jump in with directions for going from point A to point B. In essence, you can feel a part of the action without undue effort. Let me give you another example. A couple of times I got up early — about 5 local time — to walk across a nearby bridge to watch the sun rise behind — get this — le Tour Eiffel. Once, in the approaching dawn, two riders on bicycles came down the street and the voice of a girl called out, “Bon jour, monsieur!” Reflexively, I replied, “Bon jour.” On they rode and on I walked. I was delighted. People I have never, and most likely will never meet, simply took a moment to greet a complete stranger there in the melting darkness. No aspersions here, but I have never had a similar experience on this side of the Atlantic. This, in a country that was once occupied by a brutal foreign power in the lifetimes of thousands of still surviving people. We felt that in Paris. To be sure, France is not beyond reproach, and Paris is where there was a time when lopping off the heads of your political enemies in a very public manner was in vogue. Plus, post-war French government was ludicrous and corrupt with no apparent apology, inclusive of the current French president’s philandering. And recently, the French government passed a law that bans its Muslim citizens from wearing native apparel, which is equally as hateful as Arizona’s new Hispanic profiling practices. 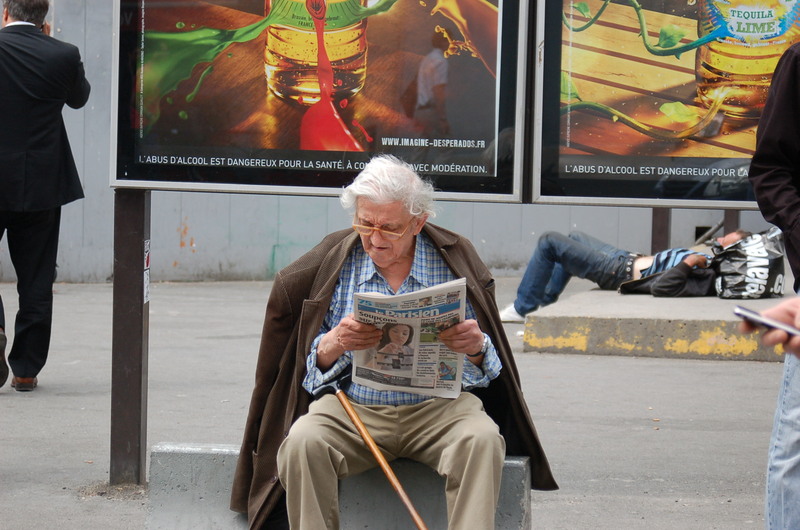 But life on the street, if you choose to appreciate it, has unmistakable and ready charm. And heavens, do they have trains! Absolute foamers delight! We were looking at a map in a station — “Is it the Number 12 train on the Green Line or Number 10 on the Yellow Line?” — and Kris just shook her head. “How — or why — did they build so many different lines? Who figured that out?” she asked. I had no idea. I just grinned, remembering that I had taken a train down from Brussels two days prior, screaming along at nearly 180 mph. That kind of stuff stays with you. On our first day home I went over to the market to pick up something for breakfast, which I intended to include a couple of croissants. Approaching an attendant in the pastries section I nearly sang out with a cheery “Bon jour” and later came close to concluding the conversation with “Merci.” No croissants, but the chance kept a smile on my face. Most of the day.